Typically a DC electronic load (eload) cannot go down to zero volts (they cannot sink current at zero volts) and their current handling and other performance specs begin to derate below 3 volts. This can be a big problem when you need to test low voltage power sources, like photovoltaic panels and power supplies for FPGAs. In this post we will look at why eloads begin to derate at low voltages and cannot go down to zero volts and look at simple configuration that will let you test power sources with an eload down to zero volts. Most eloads have limited operation below three volts. To understand these limitations lets look at a simplified diagram of a typical eload in the below figure. The FET acts like a shunt resistor across the power supply under test. As the transistor turns on harder it draws more current from the power supply under test. The power generated by the power supply is therefore dissipated in the load transistor. As long as the power supply output voltage is sufficient to bias the load transistor everything works fine. However, if the power supply voltage across Vds is low, about 3 volts or less, the load transistor can no longer regulate the current. At the point Vds minimum is reached, the load transistor is turned on to full saturation and the load it presents to the Power Supply under test is simply its saturation resistance, Rdson. As an example the below figure shows the operating curve for Agilent's N3304A Electronic Load. Notice in the figure, below 3 volts the load can be used at reduced current but it will have poor dynamic (transient) response due to the fact that the transistor is in saturation. A solution to the low voltage dilemma is to insert an auxiliary boost power supply in series with the electronic load and the power supply under test as shown in the below figure. The auxiliary supply "boosts" the supply under test's floating low such that it always appears to be at a voltage potential at or above the voltage potential of the auxiliary supply to the eload. Adding the sense lines connected across the supply under test compensates for the boost supply voltage and the cabling in the measurement. Without the sense lines you would just have to subtract the boost supply voltage from the eload's voltage measurement. The boost supply can be a low-cost fixed output 3V to 5V power supply with current rating at least as high as the maximum peak load current needed. While this configuration will compensate for the load minimum voltage requirement and voltage drop in the power leads it has some disadvantages explained next. Any voltage inaccuracies (when sense is not used) or current noise introduced by the boost supply will affect the measurement accuracy of the eload. The eload must have a high enough power rating to dissipate the power from the supply under test and the boost supply. There is a possibility that the boost supply could reverse bias the power supply under test as the voltage across the load decreases. This can occur, for example, when the power supply under test can no longer maintain its output voltage because it is in overcurrent protection mode. Fortunatly high performance eloads like Agilent's N3300 eload series employ detection circuits to prevent the third factor from occurring. In this post we looked at why eloads cannot operate at full current and performance levels at low voltages. We also covered a configuration using a boost supply that allows you to overcome an eload's low voltage limitations and to test a power source all the way down to zero volts. If you have anything to add to this post use the comments section below. In this blog post we will look at a free MATLAB program that I created and posted on MATLAB Central for download. The program is called Stability Analyzer 53230A and it provides stability analysis capabilities of clock and oscillator measurements, including Allan and Hadamard Deviation calculations. The "new" program is actually an update to a previous version of Stability Analyzer 53230A that was created over a year ago, but the new version has much more capability. The following is a summary of the program and its capabilities. Allan or Hadamard deviation plot with optional confidence intervals. All plots provide zoom and pan capabilities as well as the ability to identify a particular plot point. The program is setup and run via a graphical user interface (GUI) and is started from the MATLAB command line. If the 53230A universal counter is used with the program for making measurements then the Instrument Control toolbox is required in your MATLAB package. Below is an example analysis made with the Stability Analyzer 53230A program on a 69.251 MHz oscillator. The gap-free frequency measurements were made with the 53230A universal counter. The measurements were made at a gate time of 10 ms and a total of 5,000 measurements were made for a total measurement time of 50 seconds. The result can be seen below (click to enlarge). In the Time vs Frequency plot you can see at the measurement gate time (10 ms or 100 Hz) that the dominate noise types seem to be White FM and Flicker FM. From the Overlapping Allan Deviation plot we can see from the slope that from the Tau value of 50 ms to the Tau value of 5 s the oscillator signal is dominated by Random Walk FM noise. 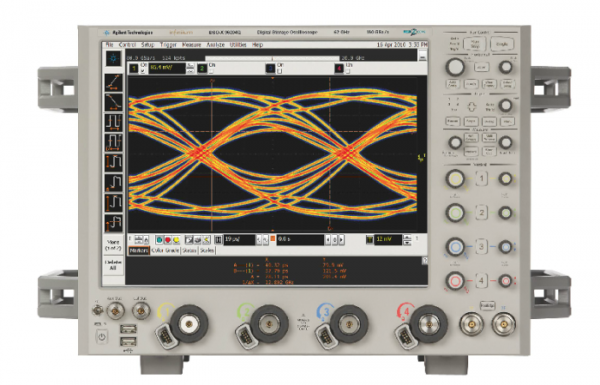 In this post we will look at a video that provides an overview of the most advanced Oscilloscope on the market, the Infiniium 90000 Q-Series. The Q-Series provides up to 63 GHz of true analog bandwidth and the lowest noise floor on the market, both of which are demonstrated in the following video. The vast majority of electronic tests involve using a digital multimeter (DMM) at one time or another. There are a variety of ways to reduce DMM measurement times to improve overall test throughput. Of course, test time improvements sometimes require compromises in other areas, but knowing the tradeoffs involved in throughput improvements and identifying what is important in your specific test situation will help you determine which trade-offs make the most sense. offsets of the amplifier and integration stages inside the DMM. However, turning this feature off cuts the measurement time in half. These offsets are initially calibrated out, but the offsets can drift slightly with a change in temperature. Therefore, if your measurements are taken in an environment with a stable temperature, or if there are several measurements taken in a short period of time (temperature changes occur over longer periods of time), the improvements in throughput by turning auto zero off will far outweigh any slight compromise in accuracy. For example, with auto zero off in a stable environment, the Agilent 34410A/11A DMMs typically adds only an additional 0.0002% of range +2 μV to the DC voltage accuracy specification. Note that with auto zero off, any range, function, or integration time setting change can cause a single auto zero cycle to be performed on the first reading using the new setting. Consequently, turning auto zero off and constantly changing settings defeats the time savings advantage. Check your DMM auto zero operation to be sure of the circumstances leading to an advantage from this change. Changing functions or measurement ranges also requires extra time in most DMMs. Try to group your measurements to minimize function changes and range changes. For example, if you make some voltage measurements and some resistance measurements, try to do all of the voltage measurements together and all the resistance measurements together instead of changing back and forth from one function to the other. Also, try to group your low-voltage measurements together and your high-voltage measurements together to minimize range changing. Voltage ranges above 10 V use a mechanical attenuator that takes time to switch in and out. Grouping your measurements by function and range will reduce your measurement times considerably. Auto range time can sometimes contribute to longer test times, but not always. The time to auto range varies with the DMM design. DMMs using flash A/D converters and parallel gain amplifiers can actually reduce test times by using auto ranging, since the time to change ranges is zero. In these cases, the time to issue a range change command from a host computer and parse the command in the instrument will be slower. Manual ranging of integrating DMMs is still the fastest way to take a measurement. Manual ranging also allows you to keep the DMM on a fixed range, which eliminates unwanted zero measurements and prevents the mechanical attenuator from needlessly actuating. Note that the I/O speed and range command parse time for the Agilent 34410/11A DMM is significantly faster than the auto range algorithm. Integration time is another parameter over which you have direct control, but there is a clear tradeoff. DMMs integrate their measurements over a set period of time: the integration time. The biggest benefit to choosing a longer integration time is it eliminates unwanted noise from contributing to your measurement, especially AC mains line voltage noise. However, longer integration times obviously increase your measurement times. For example, if the integration time is set to an integral number of power line cycles (NPLCs) such as 1, 2, 10, or 100, the power line noise contribution will be minimized due to averaging over a longer period of time and due to increasing the normal mode rejection (NMR). With an NPLC setting of 10 in a 60-Hz environment, the integration time is 166 ms (200 ms for a 50-Hz line). The larger the integral NPLC value, the larger the NMR (for example, 60 Hz rejection), but the longer the measurement time. Recently I delivered a webcast entitled "Simulating Power Transients and Noise." The webcast was recorded and is now available on demand. Below is an abstract on webcast, followed by the link to access it. The content is focused on the aerospace defense industry, but is applicable to various industries such as wireless and automotive. DC powered Shipboard, ground vehicle, aircraft, and space bound electronic circuits and assemblies employ a robust input power supply design to withstand non-ideal input power states. These non-ideal states arise from operating conditions such as large load changes on the main power source, harsh operating environments, and sudden switches from one main power source to another. These non-ideal states take the form of transients on the DC supply level or as noise signals coupled onto the DC supply level. During design these non-ideal power supply states must be simulated to test the input power supply design’s robustness against these conditions. In this webcast we will look how easy it is to create arbitrary power waveforms on modern programmable power supplies for simulating supply transients and noise. We will also look at the technology hurdles that limit the arbitrary waveform bandwidth on modern supplies. Finally we will look at low cost methods for simulating fast power supply transients and high frequency noise beyond the bandwidth limitations of modern power supplies.